Latest post Wed, Apr 17 2019 3:13 PM by Isaac T.. 23 replies. Someone at Avid replied with a call for ideas. I emailed someone, but was told they're too busy. So let me pitch you my idea. b. Create new, living Knowledge Base documents (read: continually revised) to reflect best practices. Zooming way out, "media management” means different things to different users. That's especially true if they come from another NLE. • Defines "media management" within Media Composer. • Embraces the idea that people come from different NLE’s, highlighting the differences and mapping how it works in MC. • Walks your users through different possibilities of achieving that. It may be possible for Avid to direct, but not recommend, other media management options. Or, they could partner up with select commercial shared storage and MAM providers to illustrate more possibilities. Once written, moderators would direct forum members to these pieces, instead of answering the same thing over and over (and over) again. Since these articles would be updated regularly, users can be confident they're taken care of. Going further, these articles could become new video content, increasing the possibility of consumption. How does this differ from the status quo? This writer would be “Part Of, But Separate” from Avid. Kind of like Filemaker’s (https://www.filemaker.com) relationship with Apple. With this approach, the writer would stay objective, emphasizing the possibilities without being afraid to address the limitations within Media Composer. What do you think? Is it worth Avid chasing? Note that we on the ACA Leadership Councils have already been working on this, in addition to assisting in quality control of the various existing documentation, like the "Editing Guide" that gets released with every major build (here). Plus we have been gaining lots of ground in advising on new education methods and a curriculum for public consumption, which as everyone can imagine takes a mammoth amount of work on the front-end to get off the ground (especially in the last couple of years, since SO much of the MC app is being re-coded anew). Plus we've assisted on a tonnage of revamping for Avid's internal web functions. Regarding the oft-repeatedness: yeah that was a long debate between dozens of moderators, I.T. folks, department heads and frequent community posters, but in the end nearly everyone was fighting hard to keep the repetition, because it not only illustrates people's thought patterns at the time of posting, but all of those conversations are bookmarkable. We decided not to break that. If folks disagree, that's not only fine, it's encouraged. We hope that lots of different opinions join the pool, because it opens the workflow doors wider. But the best way to do so is to join the ACA and become a Leader. Doing so elevates the discussion by proving a dedication to actively fixing issues, rather than just pointing them out. I'm not sure of everyone else's opinions on this, but I absolutely dislike the idea of hiring an outside writer. No editor anywhere comprehends the scope of every editorial workflow. That's why the ACA councils have grown so dramatically - there are just too many workflows to consider. Plus the writing would need to live inside of Avid, and be subject to the existing moderator program, which allows the dozens of us across the globe to quality control as much of the documentation as possible. Otherwise the writer would have to employ a moderator program, because unlike the old days of (for example) non-profit organizations hiring an ombudsman, today every single fact and piece of data gets ripped to shreds by the community at large. Avid does have internal writers who create all of the documentation, and they are fed info constantly from the VPs and department heads (adding writeups on new features; removing outdated info, etc). I'm sure I only scratched the surface... but the producer just walked in (%$*!! ), so I'm about to be sucked into 10 hours of whatever. PS -- Yeah we all agree about your links above concerning media management. Have you looked into Archive-R by Ocean Systems? it's been a while since I've looked into it, but they are still very active with its development and roll-out. Just had some email exchanges with them a few months ago. They're eager to talk to folks. Good morning! Really appreciate the response. Regarding the oft-repeatedness: yeah that was a long debate between dozens of moderators, I.T. folks, department heads and frequent community posters, but in the end nearly everyone was fighting hard to keep the repetition, because it not only illustrates people's thought patterns at the time of posting, but all of those conversations are bookmarkable. We decided not to break that. If folks disagree, that's not only fine, it's encouraged. I've been supporting Avid environments since 2001, and using them since 2003. The Community has basically been the same since then. I can tell you firsthand: the repetition ain't workin.'. a. Export to MP4 from Media Composer? No. Export a self-contained MOV, or QuickTime reference depending on your environment's vintage, then transcode in a separate application. b. "NEMFileWriter has detected upstream pipe stall" error - what does that mean? Typically, your host computer is too slow to transcode native files to your project's target codec. c. SFPlayConsumer:Execute TIMEOUT errors - what do they mean? Your system's too slow for Media Composer. Why? A myriad of reasons, but there are 4-5 standout reasons. The problem is: all of these solutions are piecemeal'd. Yes there's the Editing Guide, and it's encouraging to hear the progress on the Media Composer rewrite. But those don't address what users do everyday on these forums. It's mostly people trying to make heads or tails of some esoteric error message, or compare-and-connect how Media Composer works compared to their previous NLE. That's what I think this Writer could address. Most moderators aren't doing it effectively. We hope that lots of different opinions join the pool, because it opens the workflow doors wider. But the best way to do so is to join the ACA and become a Leader. Doing so elevates the discussion by proving a dedication to actively fixing issues, rather than just pointing them out. Probably better said than written, but this feels a bit disingenous. When I visit the forum, I come to help, not commiserate. You won't find me on iMDB, but I've had my moments in the sun helping users when no one else would. Sometimes people are just being reactive, but in others you could tell they were at the end of their rope. So I'm not punching down when I bring up stuff. I just think the ACA would rather build faster horses. PS -- Yeah we all agree about your links above concerning media management. Have you looked into Archive-R by Ocean Systems? Windows only. Which illustrates why I think this Writer role (as explained, but needs further articulation) would be valuable. Exactly. So instead of users making recommendations based on partial information, what if there was a living article featuring curated, Avid-approved options with descriptions of what each option could do? Whether User or Support Team, now I have something of value. No more chasing rainbows. I have an authoritative menu to choose from. I want to help. But it's ridiculous to offer the same advice over and over again when main pain points could be aggregated and presented in a unified way. Again, not talking about just workflow questions, but recurring problems and/or questions about Media Composer. My next instinct would be to hop on the phone or FaceTime and flesh out some of these other points in real time. Feel free to reach out, or pass on to someone in authority who would be interested: (845) 630-8194. Most moderators aren't doing it effectively. Thanks a lot, Issac. You do realize all the forum moderators are volunteers who edit for a living and do this in their spare time, right? when main pain points could be aggregated and presented in a unified way. Is there a company somewhere doing this already so we could see an example of what you're proposing? You do realize all the forum moderators are volunteers who edit for a living and do this in their spare time, right? I do, and it's commendable, but this isn't about any one moderator. It's this way. The forum. It doesn't work. Workers in post are losing quality of life because some core group at Avid thinks, "Users are smart. They'll figure it out." Under normal circumstances, maybe? But most Avid users are artists, not technicians. Couple that with the unique stresses of working in post, and by the time users show up here, they're not thinking, "Oh yeah! If I DuckDuckGo <MC Error Code> site:community.avid.com', I'll find the answer!" They're spent. If Avid reduced or eliminated the cable sorting with a reliable, guided experience for frequently addressed topics, there'd be less forum cruft, more value up and down the Avid vertical, and a more loyal user base. There isn't, but if I had to pick a business model it would be under an Authority Site Model. Something like Lifewire (https://www.lifewire.com) or Frame.io's WORKFLOW Guide (https://workflow.frame.io/). Again, the site authors would exist as "Part Of, But Separate From" Avid. They could remain objective, yet empathetic, writing pieces that steer users of different tiers to different options. That would generate revenue for Avid, revenue for third-party developers in the Avid ecosystem, and keep Avid relevant for the next generation. Short version: I'd rather they spent their money on improving Media Composer. There are a bunch of features on the ACA's list you can vote on right now to let Avid know where they should focus their efforts. Hiring a team to write and maintain FAQs isn't one of them. The forum. It doesn't work. Workers in post are losing quality of life because some core group at Avid thinks, "Users are smart. They'll figure it out." Under normal circumstances, maybe? But most Avid users are artists, not technicians. Couple that with the unique stresses of working in post, and by the time users show up here, they're not thinking, "Oh yeah! If I DuckDuckGo <MC Error Code> site:community.avid.com', I'll find the answer!" They're spent. What editors are stuck with only the forum as a troubleshooting resource? Subscriptions all come with support, so nobody has to figure it out for themselves. Plus, I don't know of many broadcast or feature level post houses or network-level news, sports, or promo operations that don't have some sort of in-house tech support. 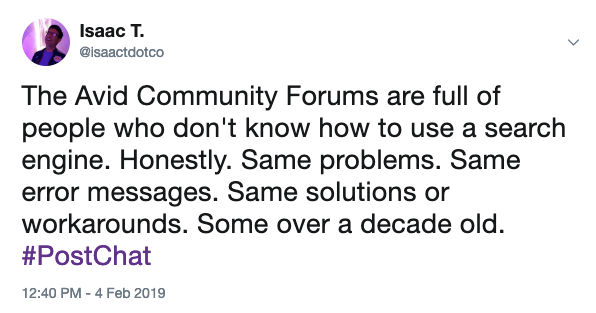 If you run a post house and you're losing money because your editor is digging through forum posts to troubleshoot a common Avid error (common enough for the curated FAQ to address), the problem is not Avid's to solve. And if there is some artist somewhere who is running solo and doesn't have the time or inclination to solve their problem by researching it themself through forum posts, what makes you think that person is going to dig through a curated FAQ to see if their question is one that has been asked already? They're just going to post on the forum with a subject line that says "URGENT HELP NEEDED!!!!!!!!" I think you've come up with a solution and now you're looking for a problem. It may look like the same questions are asked over and over, but when you drill down into it it turns out there are some broad themes ("How do I manage media the way I want rather than the way Avid does it?" would be an example), but everyone has a different version of MC, workflow, OS, ancillary equipment, whatever, so while they might get a broad brush answer out of a curated FAQ-type resource, in reality they want to chat to a few other people in a similar circumstance and ask follow up questions to learn from their fellow editors. And it does work, even with the repitition, because the only people who notice repeated questions are the ones who are here a lot helping, not the people looking for help. I have seen lots of posts asking "How do I manage media the way I want to rather than Avid's way?" but in none of them has the person said anything about how annoyed they were by all the other posts on the same subject. I've seen lots of posts complaining about licensing, but nobody says "There are too many licensing posts to wade through in order to find useful information." Yes sir, I have a solution. But I'm not inventing a problem. It's there. It's endemic of a largely unguided, repetitious forum where users can collate, aggregate, and draw their own conclusions. You, Chris, and it sounds like the ACA, frame that as a strength. I disagree. I can tell there's some emotion here. I get that. I'm not just complaining from my porch sippin' lemonade. I see a gap, and an opportunity. I think I'm uniquely qualified for the role. I made that clear to those who I emailed at Avid. I'm not hiding my intent. If you wanna FaceTime or Skype me sometime, I'd love to discuss it more in realtime. And if there is some artist somewhere who is running solo and doesn't have the time or inclination to solve their problem by researching it themself through forum posts, what makes you think that person is going to dig through a curated FAQ to see if their question is one that has been asked already? Of the items listed to vote on, performance improvements were there. But not stability. That could be it's own line item I would put at Number 1, every time. Look. I'm 40. I dubbed TV spots to BetaSP. I know what a Black Burst & Sync Generator is. But it's pretty clear Avid's missing out on the next gen. I feel like Will Smith in MiB saying, "Hey! Old guys! ", but Marques Brownlee (https://www.youtube.com/user/marquesbrownlee) interviews Elon Musk and Craig Federighi with about 4 million eyeballs watching his work. He doesn't fit one of these categories. He's in the "Other" I specified. He didn't use Media Composer, but MC | First is available? So... why didn't he cut on it? And why aren't others like him using it? Marques Brownlee interviews Elon Musk and Craig Federighi with about 4 million eyeballs watching his work. He doesn't fit one of these categories. He's in the "Other" I specified. He didn't use Media Composer, but MC | First is available? So... why didn't he cut on it? And why aren't others like him using it? Avid's total revenue backlog in the 4th quarter of 2018 was $456,000,000. I can't read an Investor Relations Datasheet to save my life, but as best I can tell that number includes all the money they were paid for goods and services, the value of subscription licenses and maintenance licenses, the value of all the contracts they hold, and money they were owed from contracts in the future. The point is I don't think YouTube creators are a market where Avid can make a lot of money. There's lots of them, but they don't need multiple seats, Isis, Interplay, Airspeed, Media Central, DNxIO, or a bespoke maintenance agreement complete with Avid personnel on site. And the places that do need all that stuff aren't going to be dictated to by a 22 year old who just graduated from college and only knows FCPX. Everyone harps on Avid needing to reach the young people because they are the future of the industry, but that's putting the cart before the horse. If someone shows up for a job interview at an Avid post house or Avid broadcast center and says anything even remotely like "I learned Premeire in college, so I won't be able to work here unless you guys switch," do you think there's anyone anywhere who would answer, "Oh, hell, you're right. Let me call Engineering and let them know we're switching to Adobe so we can hire you"? I think the ACA vote demographic question is worded the way it is because Avid knows where their market works. I can tell there's some emotion here. I get that. I'm not upset. I think it's nice that you're trying to find a new way to help people, I just don't think it's something Avid should spend their efforts on. I think the forum works fine as one of a number of ways people can get free help if they can't or for whatever reason don't want to call support. Sometimes people ask a question that has been asked before. When that happens, I answer it and we both move on with our lives. *I realize the multiple reasons this number is stupid. The Adobe number is for a yearly business subscription to the whole Creative Cloud (the most expensive one I could find), I couldn't find a solid number for an Avid enterprise subscription because you have to contact Avid sales for that. Comparing the Adobe individual yearly subscription (~$600) to the Avid individual yearly subscription (~$200) didn't seem fair to your side of the argument, plus it's beside the point I'm trying to make, which is I don't think there's a ton of lost revenue for Avid in YouTube creators. Wow, Carl. You really should've taken me up on that phone call. I'll stick with the forum, thanks. b. Create new, living Knowledge Base documents continually revised to reflect best practices. c. Eventually, those articles could be transformed into video content for more frequent consumption. I used the term "Writer", but I think I see the problem. That term's too narrow for this role. • Practices diplomacy -> Be empathetic, kind, and tactful in delivery. 2. Creating and maintaining fresh, frequently updated articles. 3. If it's asked again, the first response could be, "Have you tried this...? ", with a link to an article. If they tried, and it still doesn't work, then the article needs some revision. 4. Later or from the start: transform those pieces into easily maintained videos for those who don't have to read. With this approach, the forum can continue to exist as it always has. It'll just be a better, leaner version. Then we can all get to work, instead of working-on-getting-to-work. To be clear: I'm a business owner and working post pro. My time's valuable. That's why I'm suggesting this. I can see myself filling this role, but if its not me, someone should. Again, happy to discuss with a decision maker. Could be someone on Kathy-Anne McManus' team? What do you think, forum?